Friends this recipe is one to pin, bookmark, print out, and save for your records because this one pot Mexican chicken and rice, lovingly referred to as Arroz Con Pollo, is a foolproof, crowd pleasing, everyone loves it recipe. This shop has been compensated by Collective Bias, Inc. and its advertiser. All opinions are mine alone. #YesYouCAN #CollectiveBias This post contains affiliate links. An affiliate link means that I make a percentage of the sale if you click over and buy the item I recommend with no extra charge to you. Dinner. Doesn’t just the idea of cooking dinner make you cringe sometimes? Like crap, dinner I have to fix that tonight and I have no idea what to make. And then 4:00 rolls around and you start to really think about ordering a pizza but know thats not good for the wallet or the waistline so you scrounge around in the pantry and see what’s there. Arroz con pollo is your answer! Thanks to a few simple fresh ingredients and a few pantry staples like the delicious Hunt’s fire roasted with garlic diced tomatoes, your dinner is going to be ready and on the table and in your mouth all with satisfaction. Trust me on this one. I shopped for all my ingredients at Walmart and found the Hunt’s fire roasted with garlic diced tomatoes in the canned tomato aisle. 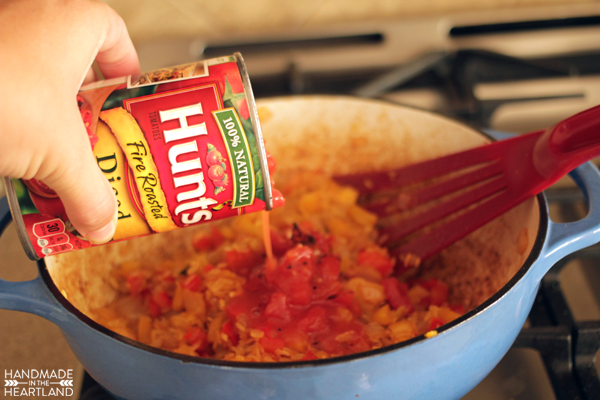 There are a ton of different flavor combinations of Hunt’s diced tomatoes and I really loved the extra flavor punch this particular variety added to my dish. I love recipes that only call for one pot, hello less dishes to clean! I use my medium size (I wish I had a super big one) dutch oven that has a lid. Its a pretty simple dinner to prep and put together. First you heat some oil over medium-high heat, season your chicken with some creole seasoning and brown it on all sides. Once the chicken is completely browned remove it from the pot for a few minutes. It doesn’t need to be cooked all the way because you will put it back into the pot. 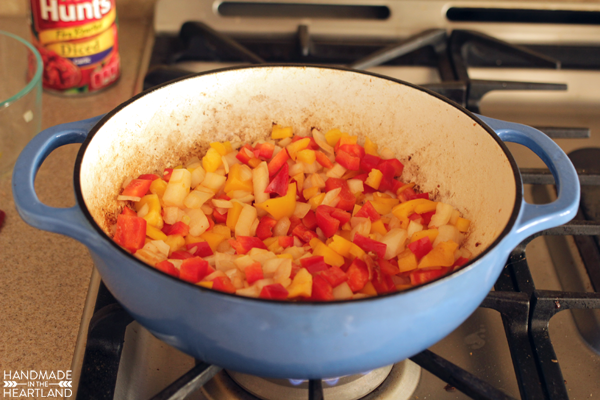 Next heat another teaspoon or 2 of oil and toss in your chopped onions and bell peppers. Cook until they are soft and cooked down. As they cook their juices should help you scrape up the brown bits on the bottom of the pot. 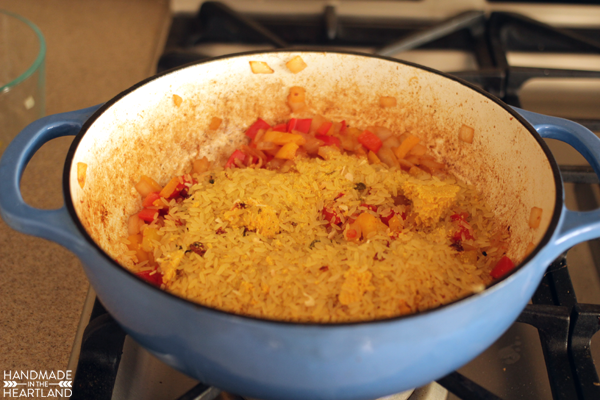 Add the yellow rice package and stir it around. Next add in your Hunt’s fire roasted tomatoes and chicken broth and stir to combine. 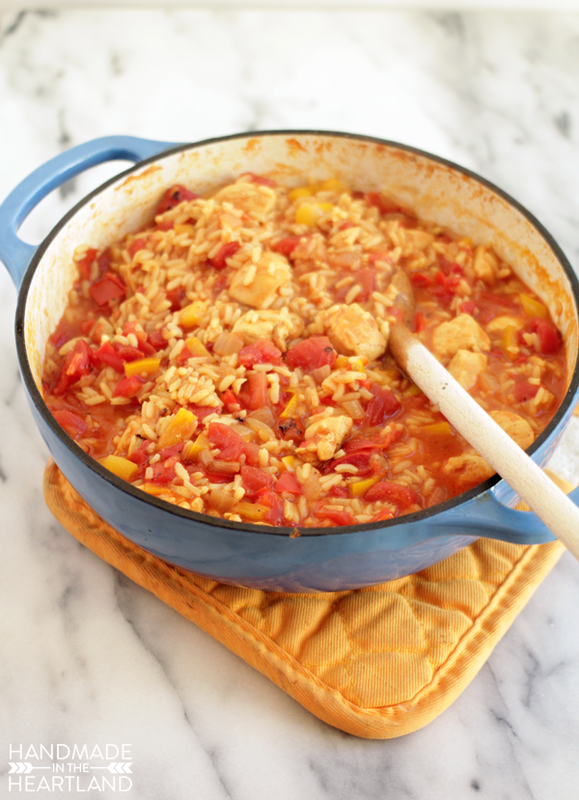 This easy one pot chicken and rice dish is a crowd pleaser! 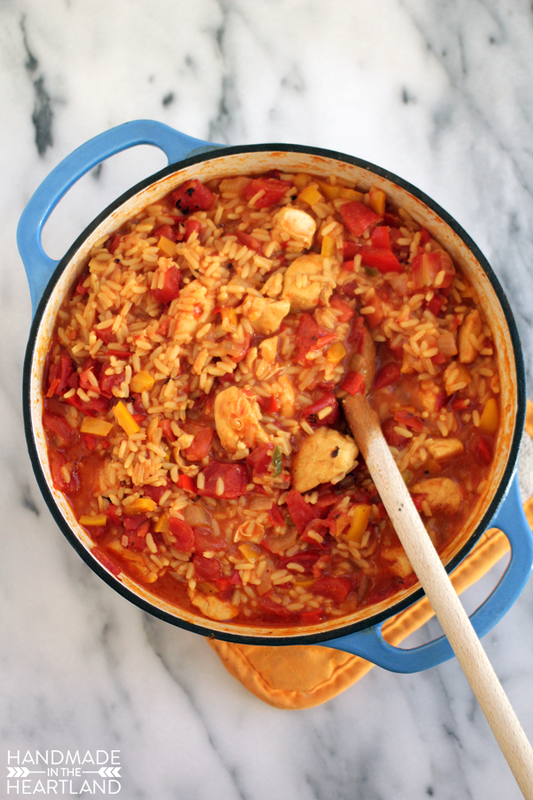 Arroz Con Pollo has tons of veggies and a great mild flavor that everyone loves! 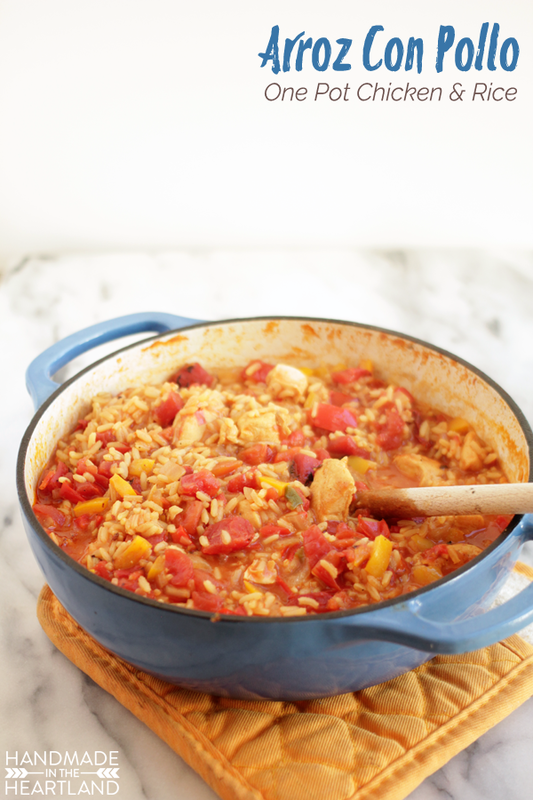 Arroz Con Pollo is a great one pot Mexican chicken and rice dish that everyone loves! Cut your chicken breasts into bite size pieces and season with creole seasoning. Dice your onion & bell peppers. 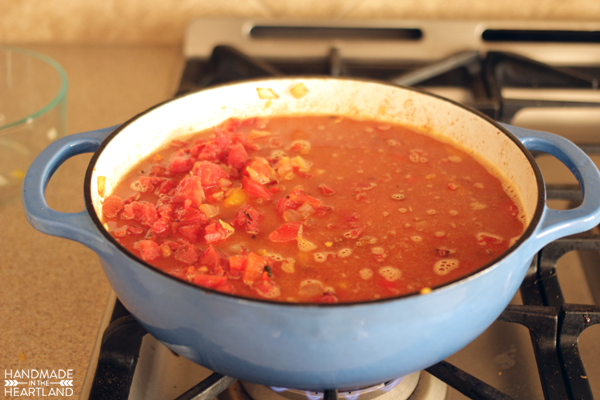 Heat a medium to large dutch oven or pot over medium-high heat and add a tablespoon of olive oil. Once the pot is heated toss in your chicken and brown on all sides. The chicken does not need to be cooked through, just browned. Remove the chicken from the pot. 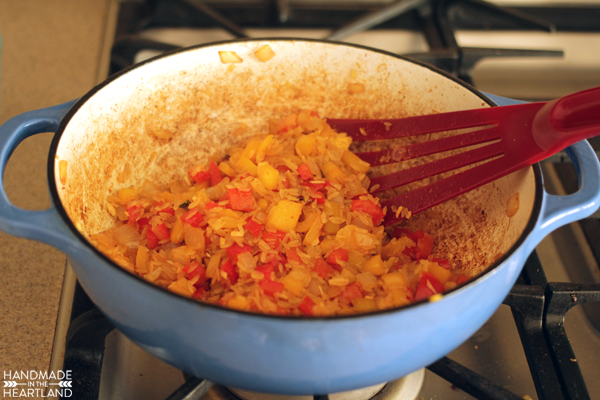 Add another tablespoon of oil and heat to medium, add in your diced onions & peppers. Cook until they are soft, about 5-8 minutes. 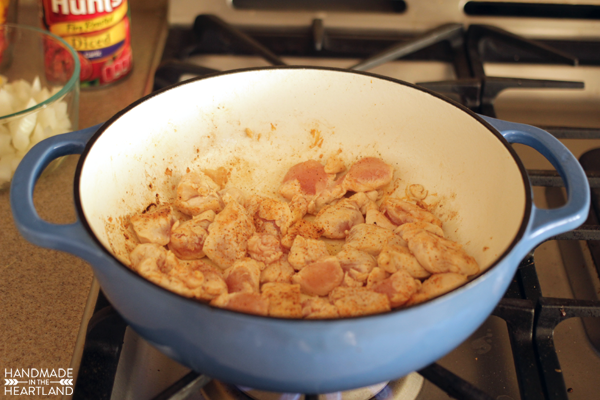 As they cook you should be able to scrape some of the brown bits left from the chicken off the bottom of the pan. Add the rice package and stir it in with the veggies. 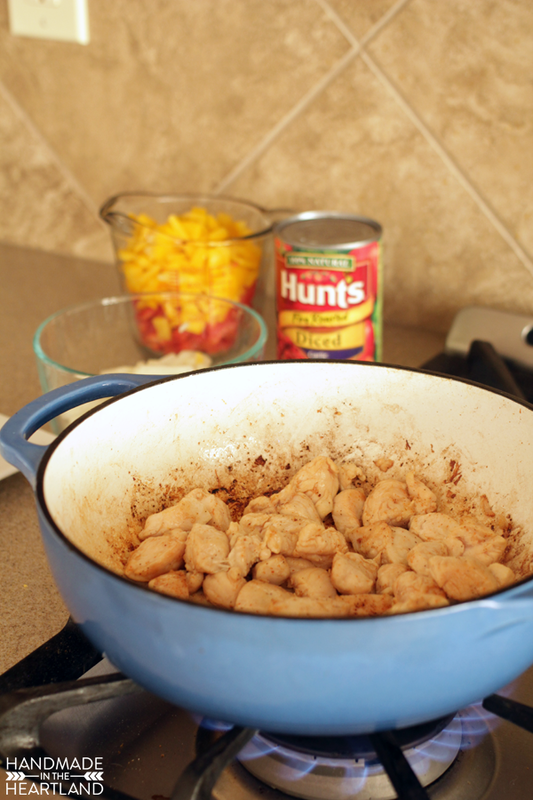 Add the Hunt’s diced tomatoes and the chicken broth, stir to combine. Dump the chicken back in as well. 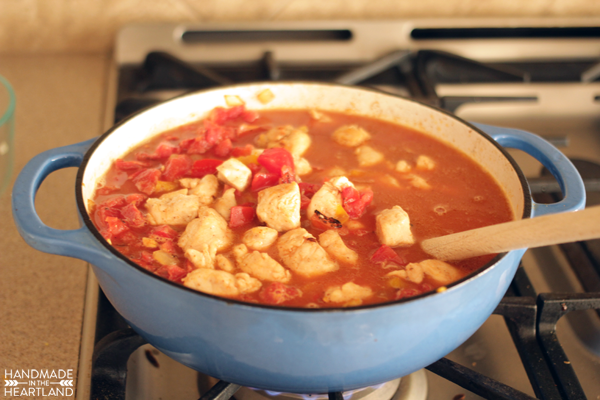 Bring it to a simmer, once it starts to simmer cover it, turn the heat to medium low and let cook for 30-40 minutes. You know its done when the rice is fully cooked. Serve warm with shredded cheese and sour cream. Enjoy! 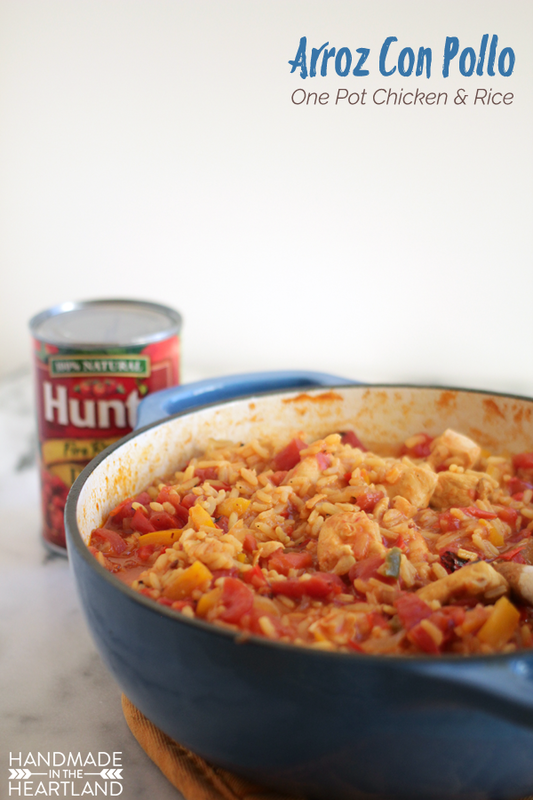 I love having great pantry staples that I can count on and Hunt’s is a brand that I know I can always rely on for fully flavored delicious tomatoes. Having them on hand in my pantry for fall meals like chili, soups, and my delicious bruschetta is a no brainer. If you make this recipe please let me know! It makes me SO happy when I see you enjoying these recipes! Tag me on instagram- @handmadeintheheartland or leave a comment below! You can see a ton more recipes to make use of your Hunt’s tomatoes HERE.